S U C C E S S is how you spell the record-breaking participation and money-raised accomplishment of this year's FOR River Regatta. Jeff Dutcher, Duck No. 500 won the custom golf cart. Kevin Rosenbohm, Duck No. 456 won the cruise. Charles Stedman, Duck No. 82 won the HD TV. Melanie Countryman, Duck No. 137 won the Kindle eReader. Brent Riley and daughters, Caroline and Charlotte, along with their dog Sadie, watch the start of the Lil' Duck Race on the San Bernard. 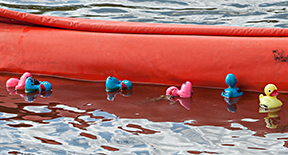 The ducks were dumped from Wayne and Barbara Riley's pontoon boat. 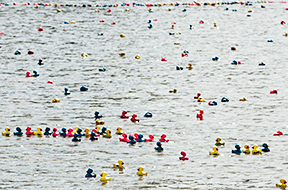 One thousand bathtub ducks fight for position in the Lil' Duck Race. Exhausted ducks rest at the finish line. "Mother Nature was uncooperative but the dauntless Duck Wrangler crew, plus an unidentified Good Samaritan* on a red jet ski, adapted and overcame." *Anyone know the name of the mystery jet skier?